The A & W Restaurant on East Oakland Avenue in Lansing. As I’ve mentioned in the past, I still haven’t figured out the fascination with Sonic Drive-In’s. J, on the other hand, loves the place. Mostly because of their Limeade. While watching TV the other night, we saw a commercial for A & W and they were promoting their new Fruit Flavored Limeades. The commercial caught her attention and the next chance we got, we headed to A & W.
There are two A & W Restaurant in Lansing. One is on West Saginaw Highway. The other is on East Oakland. We chose the Oakland store because it was the one I knew. 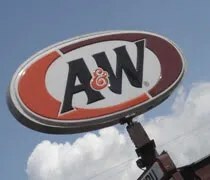 The A & W is at the corner of East Oakland Avenue and North Cedar Street. Like many businesses in the area right now, their parking lot is only accessible from one street because of the CSO project. As we were pulling up to the stoplight at Cedar Street, I had serious doubts that they were open. It was lunch time, but there was only one car in the parking lot. It looked desserted. As I pulled into the parking, there was a car that drove around to the drive thru window so we knew they were open.